This final piece rounds up my Giorgio Armani Holiday collection feature. If you're new to this blog, you can access my reviews on the gloss and palettes here and here. The company offered three new limited edition Eyes To Kill Intense shades for Holiday. #17 is pure silver, #18 is pure gold, and #19 is a blend of both. I chose #19 because... well, if I was only going to pick one, #19 would make me feel like I had all of them. My logic is not sound, but let's carry on! This will be the first of many features on ETK Intense to come. It's widely known as some of the best shadows in the industry. Don't be deceived by the pot (traditionally used to house cream/gel formulas), Eyes To Kill Intenses are highly pigmented powder shadows. The company makes some outrageous claims for this product: "twenty-four hour wear, crease proof, flake proof, waterproof, sweat-proof"; "slides on, stays on, but wipe off in an instant." Most of which are (even more outrageously) true in my experience. I couldn't test out the twenty-four hour wear claim for obvious reasons, but sixteen is enough for me! Eyes To Kill Intense #19 is a mix of silver and gold. I'm inclined to describe the blended shade as "platinum gold." 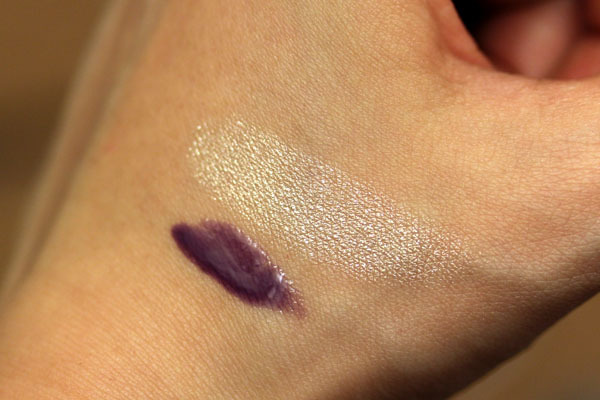 When applied on the skin, it produces a soft, ethereal sheen. 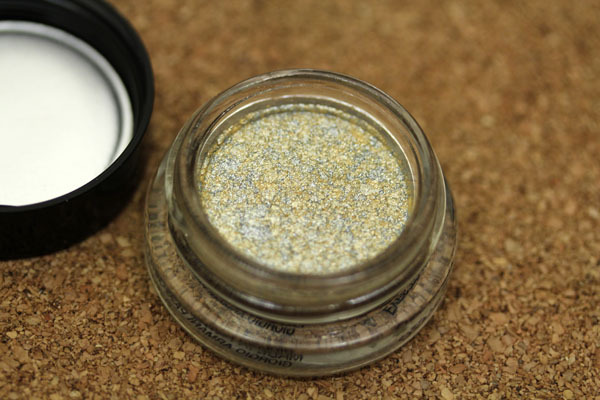 This is one of those shades that everyone should own because it's just so easy to use. 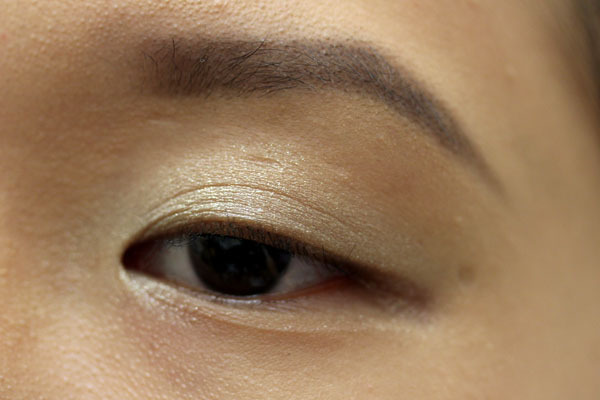 Place it at the inner corners of the eye, use it as a base, dab it on the center of the lid to complete a look, anything! You can pair it with any color in your stash and I bet they'll go swimmingly. Worn alone like above, the shadow works to subtly brighten the eye area. My peeve with ETK Intense shadows is that they don't seem to work as well when applied with an eye brush. The swatch and application above are done with fingers, which seems to be your best tool when it comes to using these shadows. One would think I would be glad, but I am a fan of the precision my brushes offer me. My finger applications tend to come off sloppy. I'm also not the happiest about it being in pot form, though I don't see how they could change that. Screwing and unscrewing the lid takes up more time than I prefer in the morning, where every second saved is one more better used for another task. Nevertheless, these shadows are of such high quality that I gladly bear with the inconvenience. For the record, #19 is the fifth pot in my growing collection. Eyes To Kill Intense #19 retails for $32 and is available at giorgioarmanibeauty-usa.com. The company is offering 20 percent off and complimentary two-day shipping on purchases above $75 till November 24, so the timing couldn't be better for you to get your Armani goodies. Just enter GAHOLIDAY1 during checkout. I'm a little peeved because I just got my package from them, but one can't have too many of their glosses, or lipsticks, or shadows... oh just give me the entire inventory already. Oh I think it has my name on it! Gorgeous!! Xiao, you are so stunning! Great review, I may have to pick it up during this sale. Despite reading many rave reviews for Armani, I still haven't tried anything! I may have to now with the sale. Beautiful look! What are you wearing on your lips? It's gorgeous! Such an amazingly stunning look! Just gorgeous. I love how it's a blend of both silver and gold. I think that makes it more wearable. I just ordered this one! But I'm surprised they don't work well with brushes for you. I've found they work best with stiff, flat brushes for me, even better than with my fingers. I adore them, and like you said, they really do last 16+ hours. You are absolutely right about this shade! I have worn it almost every since getting it. It's great as a base, and it is soooo eye-brightening! LOVE! The ETK Intense are a stand out product and are all so gorgeous! Allison- Yay! 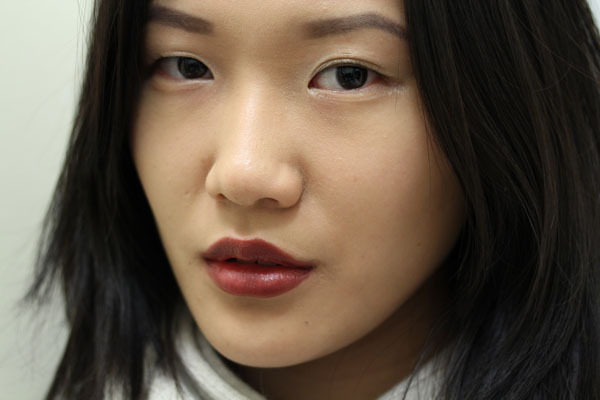 I'm wearing Chanel Rouge Coco Baroque, which is still available on the website! Tracy- I think so too! Oh bugger, i just ordered the whole holiday collection last week! could have saved a bit of cash if I had calmed down and waited a couple of days. Poo, I was hoping it'd be more pigmented =( or more...pewtery? They need a greeny-pewter shade! Alysemae- I felt the same way :( The upside is you definitely have it! I heard ETK #18 and #19 sold out within a day on the online site. The lipstick you're wearing in that final photo is stunning!